Many different eating personality types exist! There is just not one type of eater but many! This makes dieting a challenge because there is not a one size fits all plan out there. Successful weight loss and weight control are about knowing yourself and your specific eating and coping patterns in life. As you learn about your patterns, you can follow a personality type diet of healthy eating that works for you. You will also be able to make changes to the unhealthy diet habits that bring you down! The first step is awareness. Emotional Eater: This eater eats when feeling any emotion, either good or bad. Eats when happy or sad, lonely, anxious, depressed, tired or any other emotion! Mindless Eater, Unconscious Eater or Entertainment Eaters: This eater has no clue what he is eating because he is mindlessly eating. He is probably watching television, a movie or reading. Eats regular meals, but mindlessly snacks! Stress Eater: This eater eats when stress is overwhelming because food is calming, especially snack foods! Night Time Nibbler: This eater eats little during the day, and eats over 50% of calories between dinner and bedtime. Frugal Eater or Clean Plate Eater: This eater does not like to waste food! Does not stop when full, but must finish the entire plate. Stealth Eater: This eater has hidden stashes of food everywhere that no one knows about. Weekend Cheaters: This eater eats fairly well during the week, but goes hog wild on the weekends! Monday Dieters or Diet Atoners: Usually weekend cheaters are Monday Dieters. They eat so much on the weekends that they will try to even it out by starting healthier eating, or diets on Monday. This usually fades throughout the week. Buffet Eaters or Hearty Portioners: This eater loves to eat huge quantities of foods at all meals! Convenience Eaters or Eaters on the Run: This eater eats almost all processed foods from a bag, box or fast food restaurant, frozen or microwaveable. They do not have time to cook and are usually grabbing foods on the go. Regular Eater or Blissfully Unaware Eater: Eats everything, without thinking of what they are eating. Grazer or Meal Skipper: Eats all day long and may not eat set meals. This person has no eating pattern for meals at all. Fruitless Feaster or Meat and Potatoes Eaters: This eater loves meat and potatoes, and all things starchy like breads, pastas, and desserts. Many guys fall into this category! Diet Eaters: They eat diet foods. Many of these foods are processed foods that are lower calorie, low fat, or low sugar. They search for foods that have healthy food statements on them. Squeamish Eaters or Picky Eaters: This person has a narrow range of food likes. Organic Fanatic or Health Food Extremist: This person is overly concerned with health and organics. Designated Eater: This person is the human garbage disposal, and eats unfinished meals in the family. You know the give it to Dad one! These are just a few of the eating personality types out there. Most of us fall into several of the categories. There are other healthy eaters like Vegans, and Vegetarians and unhealthy eaters like anorexics, bulimics, compulsive overeaters, and fad dieters to name just a few. 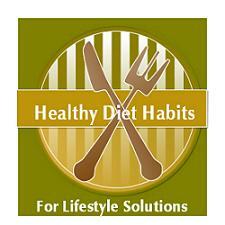 The healthy diet habit here is to develop an awareness of the type of eater that you are. Once you identify your eating patterns, you can develop some lifestyle solutions that you can use to make changes. One book that I have recently read is Dr. Kushner’s "Personality Type Diet." It is an awesome book because he offers many helpful tips for the different eating, exercise and coping patterns that fit your different personality types. It’s a must read and you can purchase it below directly from Amazon.com!